CarGurus has 2,833 nationwide Genesis listings starting at $4,500. Okay, so you want to drive like a sport without paying like a sport. Check out the 2014 Hyundai Genesis. Though rumored to be on the way out in the not-too-distant future, this full-size 5-seat sedan, introduced amid a quasi-frenzied media blitz in 2009, has traditionally offered luxury appointments at a family-friendly price. And with a trunk capacity of 15.9 cubic feet, this spiffy 4-door will let you pack all that luggage for the vacation you earned by purchasing this latest iteration Genesis rather than those mega-MSRP Beemers, Benzes or Lexuses (Lexi?) that require patent leather shoes just to kick the tires. Unfortunately, this high-end Hyundai lacks the split-folding rear seats the others carry but, silver-lining-wise, might help keep checked baggage to a minimum. Anyhow, this value-laden Hyundai sedan comes in 2 well-equipped trims, the 3.8 and the 5.0 R-Spec, with each sporting a few minor additions for 2014, including, among other things, no-cost extended BlueLink/Assurance Connected Care (emergency assistance) coverage, adaptive high-intensity-discharge headlights, upgraded electric power steering and, for the 5.0 R-Spec, a heated steering wheel. It may be noted that both trims get their respective monikers from the particular engine displacement they flaunt, with the Genesis 3.8 sporting, obviously, a 3.8-liter variable-valve-timed (VVT) V6 powerplant that mates with an 8-speed shiftable automatic transmission. Look for 333 hp and 291 lb-ft of torque from this peppy 6-banger, with mileage estimated at 18 mpg city/27 highway. The power-proclaiming Genesis 5.0 R-Spec, meantime, packs a 5.0-liter V8, also boasting VVT, and also hooked to the 8-speed shiftable automatic. Expect 429 hp and 376 lb-ft of torque from this hefty V8, but mileage dutifully suffers a bit at 15/23. Standard features gracing the Genesis 3.8 sedan include 18-inch alloy wheels (new for 2014) and heated power-adjustable mirrors outside, while leather upholstery, heated power-adjustable front seats, not to mention leather and simulated accents all grace the roomy cabin. Cruise control is, of course, standard, as are tilt-wheel steering, a remote garage door opener, dual-zone climate control and Bluetooth hands-free calling. Entertainment, meantime, is offered via the standard single-CD player with 7 speakers, satellite radio and an iPod-ready USB connection. Upping not only the agility and power ante, but exterior bling as well, the 5.0 R-Spec adds 19-inch alloy wheels, a power sunroof and power-folding outside mirrors. Inside, look for such standard add-ons as premium leather upholstery, upgraded BlueLink/Assurance Connected Care infotainment and emergency assistance technology, front and rear parking sensors, a rear-view camera and memory for driver's seat and mirror settings. Delivered telescoping tilt-wheel steering is also unique to the flagship 5.0 R-Spec, as are upgraded cabin accents, the new heated steering wheel, adaptive cruise control and a 528-watt premium Lexicon 17-speaker stereo boasting Surround Sound, a 7-inch touchscreen and NavTraffic satellite radio. The Genesis 3.8 is eligible for a number of techno-goodies that come standard in the 5.0 R-Spec, while both trims can be equipped with a number of dealer-installed accessories such as splash guards and added cargo management tools. Finally, the 2014 Genesis lineup sports 4-wheel antilock brakes (ABS), as well as traction and stability control, front and rear head airbags, front side-mounted airbags and active front headrests. Again, daytime running lights and front fog/driving lights, not to mention turn-signal-integrated mirrors, are standard across the board, as is a remote antitheft alarm. For 2014, the 5.0 R-Spec also totes standard adaptive high-intensity-discharge (HID) headlights that are optional for its 3.8 sibling. 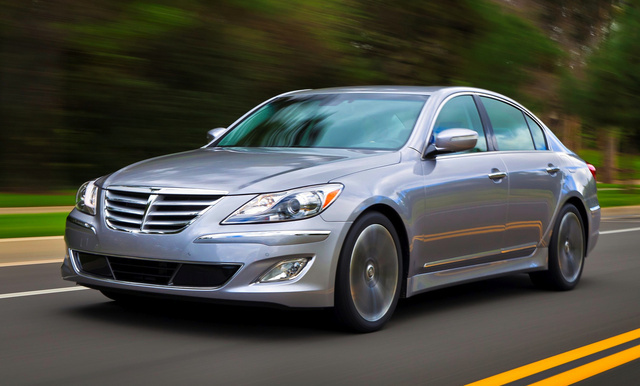 What's your take on the 2014 Hyundai Genesis? Have you driven a 2014 Hyundai Genesis? What is that A with three-arrow-around-it button near the climate control buttons ?